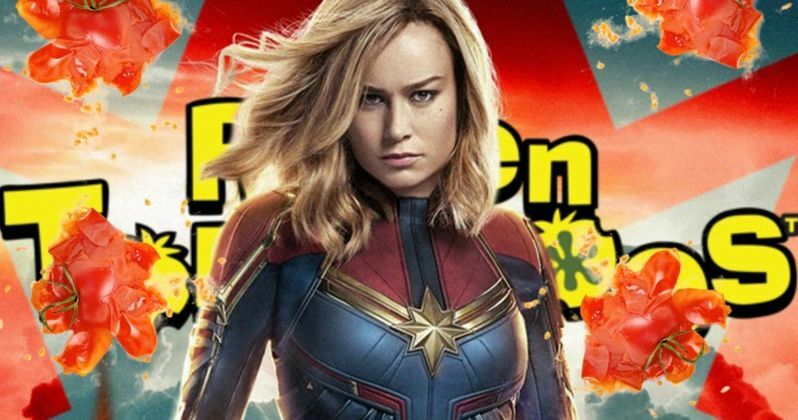 Captain Marvel is the latest victim of review bombing on popular movie review site Rotten Tomatoes. Within hours of the movie's release yesterday, there were nearly 60,000 reviews, which were mostly all negative and made with the help of bots to flood the system. Rotten Tomatoes is still tweaking their algorithms to make sure this doesn't happen again. When it comes to review bombings, The Last Jedi director Rian Johnson is pretty much an expert and 2016's Ghostbuster director Paul Feig is pretty familiar too. Rian Johnson tweeted out an article that refers to the Captain Marvel review bombings and used some dry humor to respond. Johnson said, "Pretty much the new 'Certified Fresh' badge." For the most part, Johnson is right. Certain factions of Star Wars fans were and are still not happy with The Last Jedi, which was also the target of heavy review bombings, mostly having to do with the diversity that Johnson put into the movie. To some, these decisions seemed forced. Others had a variety of problems with the movie, just take a look at the comments on Johnson's original tweet. Paul Feig famously put out the all-female version of the Ghostbusters in 2016, which was attacked for replacing the original male characters with women. Talk about the 2016 reboot has come up a lot lately with the announcement that Jason Reitman is making Ghostbusters 3 and taking the franchise back to its roots. Feig had a much different response to the Captain Marvel review bombings than Rian Johnson. He had this to say. "What a sad, sad pathetic group of people are who organize to do things like this. I mean, seriously. In the immortal words of William Shatner, 'Get a life.' Good lord." When it comes to franchises, Star Wars and Ghostbusters are some of the biggest, along with the Marvel Cinematic Universe. With that being said, an effort to add diversity has been very popular in recent years and many, or maybe not that many, aren't very happy with the way that things are progressing. There has been a growing number of roles that have brought women to the forefront and Marvel Studios is reportedly ready to have an openly gay superhero in the next few years. With such huge franchises, comes passionate fan bases who wish that things would stay the same. However, when things stay the same, they get trashed for rehashing the past, which brings us to the outrage over the latest Star Wars trilogy for "ruining childhoods" or Marvel "pandering" by having their strongest superhero in the MCU be a woman. It's pretty much a no-win situation on the internet when it comes to these things. When it comes down to it, all the review bombing does is give the movie that these trolls supposedly hate more free publicity. You can check out reactions to the Captain Marvel review bombings below, starting with Rian Johnson's Twitter account.